"The Soviet Tragedy is an essential coda to the literature of Soviet studies...Insofar as [he] returns the power of ideology to its central place in Soviet history, Malia has made an enormous contribution. He has written the history of a utopian illusion and the tragic consequences it had for the people of the Soviet Union and the world." 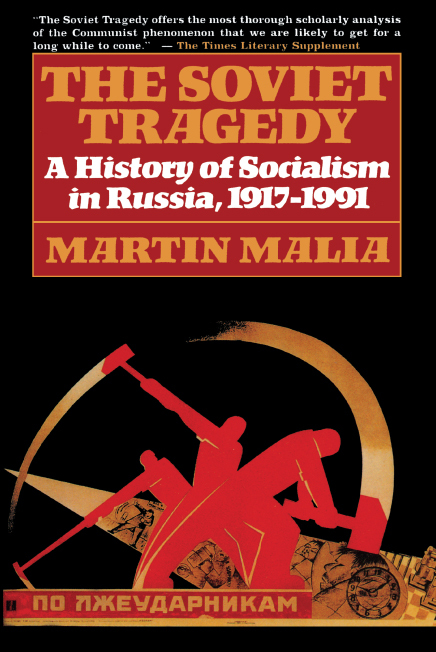 "In Martin Malia, the Soviet Union had one of its most acute observers. With this book, it may well have found the cornerstone of its history." "The Soviet Tragedy offers the most thorough scholarly analysis of the Communist phenomenon that we are likely to get for a long while to come...Malia states that his narrative is intended 'to substantiate the basic argument,' and this is certainly an argumentative book, which drives its thesis home with hammer blows. On this breathtaking journey, Malia is a witty and often brilliantly penetrating guide. He has much wisdom to impart." "This is history at the high level, well deployed factually, but particularly worthwhile in the philosophical and political context -- at once a view and an overview."